Editable UK County Boundary Maps including Northern and Republic of Ireland County Maps. Colour your own UK Councils Maps Online. 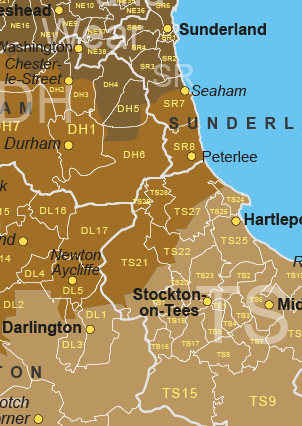 Our Vector Editable UK County Maps of the UK are highly detailed editable maps for use with something like Adobe Illustrator or Inkscape. Great for graphic designers but only if you know your way around those graphics packages. We’ve created a simple online tool that enables everyone to create, customize and colour a UK County map into Zones or Territories and save the result as a vector editable adobe acrobat pdf file. Create as many maps as you want for a small one-off fee. How many counties are there in the UK - 96 UK County Boundaries divide the UK. Download a UK County Boundary Map for free. Our maps show all the counties as separate editable labelled shapes which can be coloured individually. The labels can also be edited and coloured separately. UK County Boundaries including towns and cities.Northern and Southern Ireland are included. All the counties of the UK are shown as individually layered shapes. 1344 Towns and cities across the UK are also displayed on the map in their own layers. You can show, hide or edit any of the layers on this map. This map shows all the 124 UK Postcode Areas along with all the UK County Boundaries. The file is in a vector file format and each layer and feature can be edited using Adobe Illustrator or Inkscape. It includes Southern Ireland as counties only as there are no postcodes in S. Ireland. View County & Postcode Areas. This map is fully editable using a vector editing software package. Showing all the postcode areas and districts along with County boundaries and county names as labels. This is quite a complicated map but easily editable with software such as Adobe Illustrator or Inkscape. Whole of UK is covered. This is a vector based map which is editable in Adobe Illustrator and printable from Acrobat. Split into 650 individual editable vector shapes this map can be customised and coloured as you wish. All labels can be edited and either shown or hidden and other information can be added if required. This UK Councils map is made up of all the different council areas. All drawn as seperate shapes which can be individually coloured using Adobe Illustrator, Inkscape or Powerpoint. Its labelled with editable text for the council names and numbered areas and lists where the name is too big to fit.